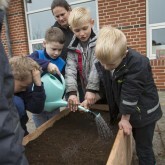 School gardens are gaining significantly in popularity in the education in the Danish public schools. 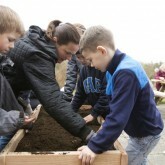 Teaching the students to grow their own wholesome ingredients and later cooking by using their own produce has broad appeal and helps to develop children’s knowledge of nature, farming, movement/ exercise, cooking, healthy eating and even culinary experiences. 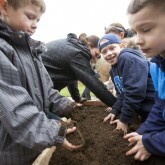 Typically, school gardens are fixed gardens placed at a geographically manageable distance from the schools. The gardens are established all over the country, but they are still offered on a limited basis – not everyone can participate. The idea behind the Mobile Gardens is to break with limitations and create modified mobile school garden projects that are accessible to everyone. 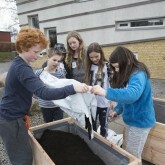 A Mobile Garden is customizable for all schools as far as form and number, and can be matched to educational materials tailored to the individual grade levels. Mobile Gardens are accessible to everyone. 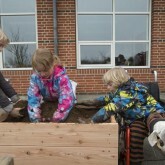 This also means that working on a school garden is not limited by a student having physical handicap. Therefore, the Mobile School Gardens project is also working on a garden model that can be raised/lowered, so students/users, for example in wheelchairs, can participate in the education on equal terms with others. With the stationary school gardens, there is often the challenge of who will tend to them during vacations. Mobile Gardens can either be “rolled” or transported by trailer home to students or to grandparents/ others, who are willing to take on the task of tending them during vacations. To make it easy for the individual school to get started with their own mobile gardens, everything is managed via internet. The project website offers a complete package or a customized solution, as well as support. Classroom teacher / educator determines how many boxes / what sizes a class needs. The boxes are ordered on the website. The types of seeds wanted for the individual boxes are selected from a dropdown menu, and the system calculates theamounts, as well as the type of soil required. Together with the boxes come suggestions for great activities for the class, as well as information. Good ideas and pictures and short videos can be uploaded. 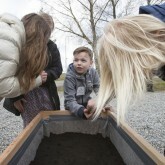 Mobile haver på Bjedstrup Skole.